District 1 – Marais des Cygnes Valley is the District 1 champion by virtue of wins over Waverly and Uniontown. The Trojans scored with 37 seconds remaining and kicked a PAT to edge Uniontown 37-36 in Week 7. Uniontown and Waverly each sit at 3-1 and will meet this week at Waverly to decide the runner-up playoff spot. District 2 – Udall is 4-0 in district play and clinched the District 2 title with a 56-26 win over Cedar Vale-Dexter last week. The Eagles will get the winner of that Uniontown and Waverly game in the first round. Meanwhile, Cedar Vale-Dexter is the runner-up by virtue of their 64-14 win over West Elk back in Week 6. The Spartans will open the playoffs at Marais des Cygnes Valley. District 3 – Peabody-Burns clinched the District 3 championship with a 42-34 win at Burlingame last week. The Warriors are unbeaten and will get either top-ranked Hanover or defending champion Osborne in the first round. Madison hosts Burlingame this week with the winner qualifying as the runner-up and drawing the Hanover / Osborne winner in the first round. District 4 – It all comes down to the battle of the unbeaten ranked teams when Hanover hosts Osborne this week. The winner is the district champion, while the loser advances to the playoffs as the runner-up. Osborne had to survive Wakefield 56-54 in overtime to be in this position. The Bulldogs have won 21 consecutive games. District 5 – Central Plains clinched the district title with a 58-0 shutout of Solomon after beating Little River 22-6 back in Week 6. Little River will travel to Solomon this week to decide the runner-up spot. The winner of that game will travel to Pratt-Skyline in the first round on Tuesday. District 6 – Pratt-Skyline has won the District 6 championship and qualified for the playoffs for the first time since 1999. South Central can clinch the runner-up spot with a win at Kinsley. Should the Coyotes win and Kiowa County lose at Macksville, then Kinsley would claim the runner-up spot. If Kinsley beat South Central and Kiowa County takes care of business against winless Macksville, the three would be tied and the points tie breaker would be used and Kiowa County would need to at least win by 10 to have a chance at overtaking South Central. District 7 – Spearville is the district champion after last week’s 50-28 win over previously-unbeaten Hodgeman County. The Royal Lancers will host Atwood-Rawlins County in the first round of the playoffs. The District 7 runner-up will go to the winner of this week’s game between Hodgeman County and Ness City. Ness City has played well this season with only a 50-38 loss to Spearville and a 26-22 loss to 8-Man II No. 2 Victoria. District 8 – District 8 has already been decided as Oberlin-Decatur Community won the title with last week’s 52-44 win over Atwood-Rawlins County. As a result, the Red Devils will be at home to open the playoffs on Tuesday, while the runner-up Rawlins County will travel to Spearville. District 1 – This district is already decided as Axtell (4-0) claims the championship by virtue of their 42-14 win over Pike Valley (3-1) in Week 7. The playoff appearance is the first for the Eagles since they made the state semifinals in 2008. Pike Valley has qualified as the district runner-up. A loss by the Panthers this week at Southern Cloud would drop them to 3-2 in the district, but they would hold the head-to-head tiebreaker over both Frankfort and Linn should either of those two teams also finish 3-2. Axtell will open the playoffs at home, while Pike Valley will travel to District 2-champion, Chase. District 2 – Chase (4-0) has clinched the District 2 title as the Kats hold the head-to-head tiebreak over Sylvan-Lucas Unified (3-1) with a 44-28 win in Week 6. Sylvan-Lucas will host Centre-Lost Springs this week. Centre can claim the runner-up spot with a win and a Wilson loss to Tescott. If Wilson and Centre win, they will each be 3-2 along with Sylvan-Lucas and the points tie-breaker will decide the runner-up spot. In that case, the worst Sylvan-Lucas could finish with is +26 points, Centre +9, and Wilson -1 giving the Mustangs the runner-up spot. Bottom line, if you’re a Centre fan you are rooting for your team and Tescott this week. District 3 – Top-ranked Chetopa has qualified for the playoffs, but can clinch the district championship with a win over Hartford. The Jaguars can clinch a playoff spot by beating Chetopa. Southern Coffey County can clinch a runner-up spot with a win and a Hartford loss. Southern Coffey County holds the head-to-head advantage having edged Hartford 28-22 in Week 5. District 4 – Argonia-Attica is the district champion by virtue of a 60-38 win over Caldwell in Week 5. Caldwell is the district runner-up because even though the Blue Jays could finish in a tie with South Barber and Pretty Prairie in the district standings, they have beaten them both head-to-head. District 5 –Minneola and Stafford will face off to determine the district championship in Stafford this week. The winner is the district champ, with the loser qualifying as the runner-up. District 6 – Ingalls has clinched the district title by virtue of a 48-0 shutout of Satanta back in Week 6. Satanta can clinch the runner-up spot with a win over Deerfield. A Deerfield win coupled with a Moscow loss at Rolla would put the Spartans in the playoffs. Should Deerfield beat Satanta and Moscow beat Rolla, a three-way tie for the runner-up spot would occur and the team with the most district points would qualify as the runner-up. 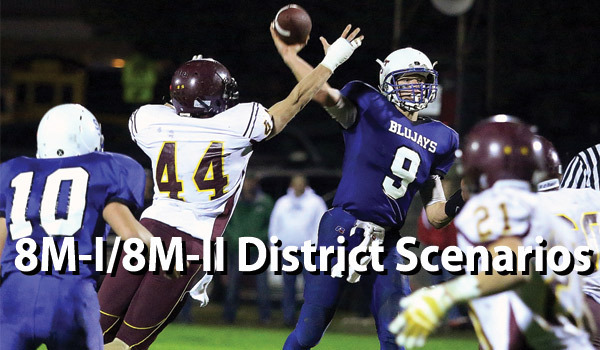 District 7 – Victoria is the district champions having already defeated Beloit St. John’s-Tipton and Thunder Ridge. St. John’s-Tipton can clinch the runner-up spot by defeating Northern Valley this week. Should the Huskies win, a three-way tie with St. John’s-Tipton, Thunder Ridge, and Northern Valley will result. Thunder Ridge would be the runner-up in that situation since the Longhorns’ forfeit win over Natoma would give them +38 district points; better than St. John’s-Tipton or Northern Valley could finish after a Husky win. District 8 – Sharon Springs-Wallace County (5-0) has clinched the district championship by virtue of their win over Hoxie, 24-16 in Week 4. Hoxie’s regular season is complete and the Indians are the district runners-up after finishing 5-1 in District 8.